There is also a possibility to change opacity (alpha property) and color of an object. The combination of these types may give outstanding results. Your specification has to include a description of the transformation type. 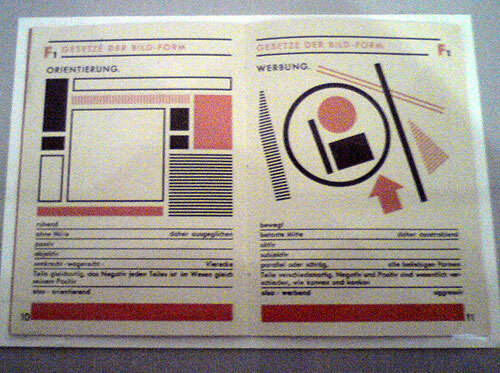 Visiting the exhibition Van Doesburg and the International Avant-Garde at the Tate Modern, I was struck to see something like a website wireframe in a small book from 1930, ‘Gesetze der Bildform’, by the modernist artist Kurt Schwitters. On these two pages he compares / contrasts orientation with advertising. I do agree that visual structure is key to clean and scannable interfaces but this insight is often being challenged in usability test sessions. Presenting information in a purely structurded way implies some level of abstraction that many users (particularly casual ones) cannot follow easily as it makes them ‘think’. And this is what UX designers want to avoid by all means :-). People often prefer plain language information, phrased in full sentences. My guess: it’s because a sentence is more explicit and is better suited to mimic a conversation (which successful HCI is all about). This does not hold true for any site and any type of information and it doesn’t undermine the good principles that you’ve outlined here. But it shows that minds work differently and many people want to be addressed in a more direct (as you call it) prose style.